I start a new residency tomorrow but I thought I would show you one of my last clay projects, animal pinch pots with Grade 3. Sorry for some of the photo quality but the school lighting is always a challenge. Each child chose their favourite animal. Some had their pots up on legs, some had the pot on it's side having a large mouth. It was great to see all the different versions. Take a lump of clay about the size of an orange. You will be working on your cloth placemat or paper towel. Using your thumbs push into the centre of the lump. Start to form a pot. Push down on the bottom to help spread the pot out. Continue to form a nice shape. You don't want it to be thicker than an inch on the sides or bottom. You also don't want it to be too thin. Dip your finger into the water and rub along the rim on your pot. Make a nice edge. Smooth the sides as well. For this pot I'm adding a head to the front. I take some more clay and form a nice head shape. I keep it flat like a cookie so that my pot does not get too thick and then won't dry out. To 'glue' clay to clay I make little scratches on the 2 surfaces. Dip your finger in water and add some to the scratches. Attach head. Using the wooden skewer and add detail to the face. Add some newspaper to the pot to help it keep it's shape when drying. Add arms and legs. Remember to 'scratch, scratch, water, water'. In my pot I made my arms and legs flat and attached up against the pot. If you are adding legs to hold up the pot make sure they are short and stubby. No giraffes here. To make a long tail you can roll a snake. I then added it flat to the pot. A short stubby tail could stick out but no long tails as they would just break off, better to attach to the side of the pot. When you have finished sculpting, set pot aside to dry. Drape with garbage bags or plastic tablecloths for 2 days to equalize. Uncover and then let clay fully dry out, about 11-12 days. Here is some of the clay at my last residency drying out. When the clay has dried do a bisque fire. When the clay has been fired and cooled you can glaze. Finish with a glaze fire. With air dry you'll skip the firing and paint with acrylic paint when the clay is dry. I have lots of new projects coming up that I'm doing at my next school so I hope to post them all shortly. 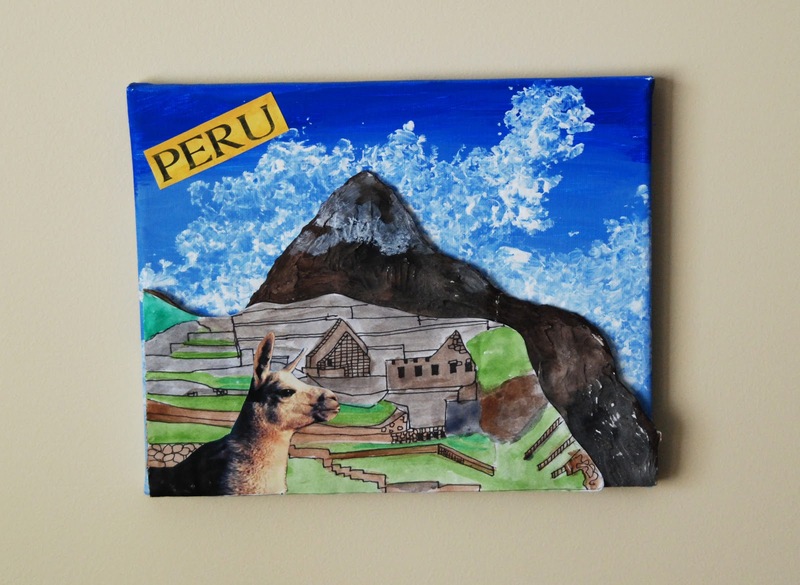 Last year I came up with this canvas project for Grade 3 to tie in with their social studies curriculum. I describe it to the students like a postcard scene. To give Grade 3 a choice this year I introduced this Taj Mahal canvas for India which is another country covered in social studies. - snippet of text, "Taj Mahal", "India"
Take your cardboard, measure to fit the width of your canvas. Sketch on the Taj Mahal in pencil, using a photo for reference. Take some drywall medium, I buy mine from the hardware store in a big gallon size for around $20.00. Scoop out a little onto a recycled foam plate. Using your finger add some to the dome and towers. You are building up texture to make the building appear more 3D. Paint your primed canvas a nice sky blue with acrylic paint. Be sure to do the sides as well as we won't be framing this canvas. Set aside to dry. At school we work on top of art boards and wax paper. Every student wears an art shirt to protect their clothes from the acrylic paint. After the drywall has dried, about 6 hrs., paint the rest of the cardboard with white acrylic paint or gesso. You want to cover up the cardboard brown. Take some white paper or card stock, cut to the width of the canvas. Sketch in the promenade of the Taj Majal. Cut to fit at bottom of both your canvas and cardboard Taj Mahal. Print or hand write a title for your canvas. At school I had pre printed titles in a variety of fonts for the kids to choose from. Trim and then paint with the disk tempera. When the paint has dried on your cardboard Taj Mahal you can add details with a fine sharpie, shading with a grey pencil crayon and highlights with a yellow pencil crayon. Apply tacky glue to the back of cardboard and put in place on the canvas. Glue on the painted paper and the title. Now I know there are probably not too many elephants strolling around the grounds of the Taj Mahal but we put one in anyway to give it the same appeal as the Peru canvas. Cut around your photo and then glue into place. You can now add a coat of Mod Podge but apply generously and don't do any extra brush strokes. The disk tempura will start to smear if you do.